Living… in Santa Carla, the tiny town that he, his mom, and his little brother moved to from Phoenix. Even worse, they’re stuck in his Grandpa’s house. Worse still, his Grandpa’s a taxidermist. The first thing that Michael says upon seeing his grandfather’s work room is, “Talk about Texas Chainsaw Massacre.” At least there seems to be some cool people on the Boardwalk near the ocean. Profession… student. But right now, it’s summer, and Michael has nothing but time to kill. He’s supposed to spend much of that time looking after his little brother, Sam, but something else has caught his eye. There’s a biker gang and a pretty girl that he wants to find out more about. Sam will be fine on his own. Challenge… protecting his family, helping Star, and overcoming these weird things that keep happening to him. Floating in midair, for instance. David and the gang won’t explain, Sam is scared of him, and even Nanook the dog turned on him. Is there any way to reverse the changes that are overtaking him? Personality… determined and cool. The good-looking Michael doesn’t talk too much and likes to play the rebel, but when it comes down to it, he’ll do anything for his family, or for the girl he likes. He might go out late at night, tease his brother, and do all those other teenager things, but he isn’t afraid to go against peer pressure when he feels it’s wrong. Michael Emerson's popularity ranking on CharacTour is #2112 out of 5,000+ characters. See our top-ranked characters and read their profiles. A mother and her two teenage sons move to a seemingly nice and quiet small coastal California town yet soon find out that it's overrun by bike gangs and vampires. 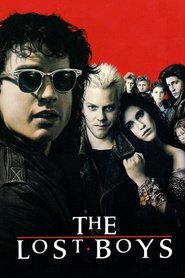 A couple of teenage friends take it upon themselves to hunt down the vampires that they suspect of a few mysterious murders and restore peace and calm to their town.